Tired all the time syndrome is described as an exhaustion epidemic. Tired all the time syndrome is now being described as an exhaustion epidemic. With 80 percent of women in some Western countries now complaining of extreme fatigue, it's a serious problem. This page was upgraded by Dr Barrie Lewis DC on 23rd October, 2018. The knock on effect of TATT, as it's being called, is huge; you drag yourself off to work, the children's homework is not given the attention that it deserves, exercise becomes impossible and a cuddle under the blankets is just out of the question. Worse, convenience food becomes the order of the day; cooking a proper meal happens only over the weekend. The tired all the time syndrome is a complex subject, not to be treated superficially; this is a long page; come back later if you don't have at least fifteen minutes to read it. Why does it affect mainly the ladies is a good question? Menstruation is part of the equation, but perhaps even more significant is that most women usually work far too hard; on top of a full time job, they have to care for the children, do the shopping, prepare meals and clean the house. It's simply too much for the average person, if hubby isn't pulling his weight; and he too may be over committed in the corporate environment, or just watching one ball game after another. The Netherlands has got it right; only career women work full time; for the great majority two ladies share one job. It's a recognition that home making is really an occupation that can and probably should occupy the whole of a person's life during the child bearing years. But greatly contributing to being tired all the time is a poor diet; the World Health Organization reports that 30 percent of the population is suffering from iron deficiency anaemia; women and children are particularly vulnerable. Iron is an essential part of the red blood cells that carry oxygen to the brain and obviously the whole body; a deficiency means chronic fatigue. Women and children are particularly vulnerable; being tired all the time is the result. Kids are unable to concentrate in class affecting their behaviour and performance and may be labelled attention deficit for all the wrong reasons. Inadequate levels of folate and omega-3 will also contribute to poor school results. Tired all the time syndrome is complex but iron and folate deficiency due to a lousy diet is a major factor. Organic meats are generally acknowledged as being the richest source of naturally occurring iron in the diet but what's not recognised is that in general vegetarians get an equal amount, or more, from their food. That's because green leafy vegetables like spinach and kale have both iron and the beta-carotene that enhances the absorption of minerals; that from supplements is poor with nasty side effects. In the Netherlands iron supplements are not often given. In short, if you suffer from one of these exhaustion syndromes, you need to look to both lifestyle and your diet. What effect on your career, and health, would it have if you worked part time and exchanged your deluxe motor car for something smaller? All work and no play makes Tom a dull boy; and it makes Suzie a very tired and irritable girl. Small dietary changes that would make a huge difference could be as simple as exchanging that morning coffee for a glass of freshly squeezed orange juice; the vitamin C and beta-carotenes enhance the absorption of minerals like iron in your breakfast. 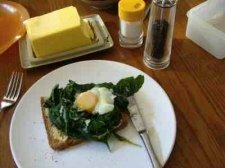 Then enjoy a free range egg on a bed of fresh spinach, with 100 percent whole wheat toast several days a week. Greens and whole grains are a rich source of iron and calcium. The word 'heme' is derived from the Greek word for blood. Heme consists of an atom of iron, actually the positively charged ion to be more precise, connected to another molecule. This heme then can attach to a protein like globin, to form the molecule of hemoglobin that carries oxygen in the blood. This is how it happens in animal proteins like egg or meat. Heme and non-heme iron sources are not equally absorbed in the gut; and in fact in both cases absorption is very dependent on other micronutrients like vitamins that are consumed. So, much of the mineral will pass right through the alimentary canal and out in the feces unless the conditions are right. As stated above, the iron in animal products like meat, cheese and eggs is attached to a protein and is known as 'heme iron'. However, in plants this is not the case, and the mineral is known as 'non-heme iron'. Yes, I'm repeating myself, but I was once a teacher; repetition is the way to remember and understand things. As a general rule, heme iron from animal products is better absorbed, but there is a wide range, between 7 and 35% depending on those other factors. Non-heme iron is generally not as well absorbed, ranging between 2 and 20%, but notice with the right conditions, iron from plants may be absorbed at the rate of 20%, and that from meat at only 7% if those conditions are not met. Thus you cannot blithely assume that vegetarians are more likely to be anaemic than we carnivores. Best of all is a combination of iron from both animal and plant sources. Iron and vitamin A go hand in hand; and its precursor, beta-carotene is even more effective. Research published in J.Nutr 128, the Journal of Nutrition (3), scientists found that adding vitamin A to a cereal based diet increased the iron absorption from wheat 0.8 times; nearly double. And the addition of beta-carotene increased the absorption of the mineral nearly three times. They theorised that vitamin A and beta-carotene form a complex with the iron, keeping it soluble, reducing the influence of the phytate in wheat and polyphenols in coffee, for example, that would inhibit absorption. However one is likely to become neurotic, wondering if you've had enough of this mineral and that vitamin, this indole and that lignin. Far simpler is to make sure you've enjoy many coloured foods every day; then you will know that you are getting all the micronutrients that are demanded by our bodies to prevent tired all the time syndrome, and sparkling good health. Strong research, after following people for 20 long years, shows that those enjoying eight coloured foods most days have a 35% lower all cause of death; that's massive. Tiredness means you are less likely to exercise too, and so have brittle bones and have a much higher chance of getting Alzheimer's disease, for example. Phytates are naturally occurring plant chemicals found in most legumes and grains, nuts and seeds; they will bind some minerals including iron. They are not a factor in the well rounded diet, but if you are eating a great many grains, and not enough coloured foods, it can be a problem. The affect of phytates is greatly reduced by soaking, rinsing and cooking. For example, in the preparation of chickpeas or bulgar wheat, soaking the grain or legume overnight and then rinsing several times prior to cooking would greatly reduce the problem of the phytates binding to iron. Adding a little lemon juice whilst soaking would help too. Traditionally the addition of lemon to hummus or tabouli provides the vitamin C that reduces the effects of phytates on mineral absorption. Making what is known as artisan bread also helps; the long fermentation of the wheat prior to baking reduces the effect of phytates on iron and calcium absorption; if you are tired adding yet another chore may not appeal but with the use of a machine it takes only five minutes of your time to bake your own loaf. Just as important you have control of what goes into the ingredients. The supermarket loaf has far too much salt, added sugar, preservatives and enzymes to ensure a quick rise; exactly what bread experts tell us you don't want. It's not recommended that we add extra bran to our food; enjoyed naturally in whole grains it supplies natural fibre to promote a healthy colon, and the lignins compete with circulating hormones that may cause breast cancer. Phytates also act as a natural anti inflammatory component of the diet which is obviously highly desirable in a world suffering from angry joints and organs. However, adding extra bran can contribute to iron and calcium deficiency, causing tiredness and brittle bone disease. In practical terms, this means enjoying dark green leafy vegetables like spinach which are a rich source of both iron and beta-carotenes, along with grains and legumes that would inhibit the binding effect of phytates on iron absorption, and probably calcium and other important metals like zinc too. A breakfast of spinach on whole grain toast would inhibit the effect of any phytates in the wheat on iron absorption. 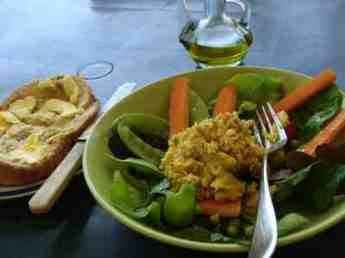 The beta-carotenes in a lettuce based salad would likewise block any effect of phytates in the hummus on iron absorption; and the wholewheat bread. The WHO promotes these ideas of selecting iron-containing foods, along with meal patterns that are favourable to increasing the bioavailability of iron in the treatment of conditions like tired all the time syndrome. 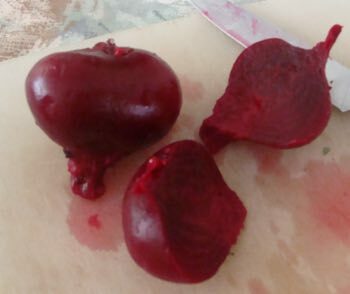 In the supplementation context, the WHO research reports that both vitamin A and beta-carotene have only a partial effect in treating anaemia but, given together with iron, 97% of cases responded well. It is of interest that a significant association (between iron absorption and vitamin C) was observed only with dietary vitamin C, but not with supplemental ascorbic acid. 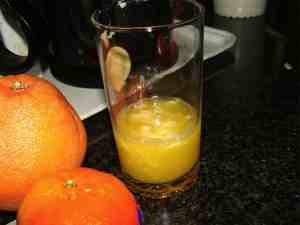 This benefit is only observed if food containing vitamin C is consumed in the same meal as the iron rich meal. Multiple regression analysis showed that phosphorus had a significant inhibitory influence. In short, the vitamin C from freshly squeezed orange juice, and perhaps even OJ, is significantly more effective than taking ascorbic acid. Notice at least half of the nutrients are found in the pulp of orange juice; straining it out greatly reduces the benefit. After citrus, the pepper family is the next best source of vitamin C; however most greens, cauliflower and tomatoes are also good sources, and they must be had in the same meal as the iron rich food. And finally colas have a very negative effect on iron absorption. You'll find lots of contradictory opinions on the web; some suggest vegetarians get more absorbable iron, others that they are at risk of becoming anaemic. It all depends on how rounded, unprocessed and unrefined the diet is. There are three types of anaemia; an iron deficiency is only one. The other two are are caused by too little folate and B12 in the diet; both are part of the B complex. A shortage of any one of the will cause tired all the time syndrome. The B vitamin complex is particularly involved in energy production in the body. For example, a thiamine deficiency is a common cause of tiredness. A shortage of B12 and folate cause other forms of anaemia that will affect the ability of red blood cells to carry oxygen to the brain and tissues. Generalised muscle weakness and the tiredness syndromes are signs of a thiamine deficiency. Eggs in general, and in particular free range cage free eggs are a particularly good source of vitamin B12. High folate levels are particularly important for the young woman; not only will a deficiency cause anaemia and the tired all the time syndrome, but also the likelihood of a serious birth defect in her child. All of these issues can be addressed in one single meal; eggs Florentine on wholewheat toast. My favourite is this eight colors eggs Florentine recipe. The most common, and vastly beneficial omega-9 fatty acid is oleic acid, a monounsaturated oil found in large quantities olives, avocados and macadamia and almond nuts in particular. It is the main ingredient of myelin used to coat the nerves. Without the myelin sheath most nerves will not conduct. An interesting study published in the American Journal of Clinical Nutrition (April, 2013) found that those eating a diet rich in oleic acid had more energy, and equally important better mood; they were less inclined to become angry. Anyone suffering from tired all the time syndrome would be well advised to enjoy more olive oil and avocados in their diet. Non-work related issues such as excessive television and browsing of the internet without a doubt contribute to tiredness; having been awake for 17 consecutive hours affects performance, for example, equivalent to working at the legal driving blood alcohol limit; you are four times more likely to have an accident. Tired all the time syndrome is a complex issue. Many of the great human catastrophes like the Exxon oil spill off Alaska, and the Chernobyl nuclear disaster have been attributed to sleep deprivation. Health is additive; if you are anaemic due to a poor diet, haven't had a proper holiday in years, watch too much TV and then have a night out on the town, then a you are a disaster waiting to happen. Add to that work related fatigue, and emotional issues at home, then it's game set and match. Chronic pain is where tired all the time syndrome is a part of the chiropractic regimen. If you read the letters on the right hand side of this page you'll soon realise that many people have have ached for a long time. It's a huge contributor; for example, if you simply have to go to work, but you know that all the sitting is going to make you miserable, exhaustion sets in even before you've put the foot in the door. Chiropractors are in the business, in part, of improving movement and lessening chronic pain; and teaching you had to care for your own frame. It's really quite astonishing how, for example, a walk in the park lessens tiredness. In conclusion, concerning tired all the time syndrome. Are you working too hard and when did you last take a restful vacation? Are you regularly having at least seven hours sleep in each 24 hour period? Are you enjoying green leafy vegetables with your meat and potatoes? Soaking, rinsing and cooking legumes and grains helps to remove phytates. Artisan bread is one example. Tabbouleh Bulgar wheat - soak, rinse, cook. Cooking chickpeas - first with a long soak and then several rinsing a number of times. Sadly in life there are no quick fixes; that applies if you are suffering from low back pain, headaches or one of the chronic fatigue syndromes; just ask your chiropractor, or any neurosurgeon for that matter. It's our unwillingness to face the need for more exercise, a longer holiday and better food, constantly seeking out the KISS principle, that turns us into chronic pain sufferers and constantly exhausted people. Keeping it simple, silly, is an anathema; these are complex issues. One B complex pill would help but not deal with the underlying cause of your tiredness syndrome. Plus, eggs Florentine, tastes absolutely divine and only takes about five minutes to prepare. I know, cooking it every day for breakfast; and pushing seventy have masses of energy for the demands of the day; the B complex vitamins and iron in the food I eat are a large part of the reason. Trust me, I'm a doctor! Do as I say, and as I do; and I do the lower lower back exercises found in the navigation bar at Chiropractic Help every single morning before getting out of bed; I don't like pain, and I don't enjoy being tired all the time.